The Barry County Clerk recommends two methods of obtaining the county vital records. Individuals can visit the genealogy research department in the Clerk office, which is located at 220 West State Street in Hastings, MI., every day except Thursday from 9:00AM till 4:00PM. Birth records are available from 1867 to 1900, death records from 1867 to the present, and marriage records from 1839 to the present. They also have divorce and cemetery records available for research. For obtaining actual copies of records, the County Clerk recommends the VitalChek Service. 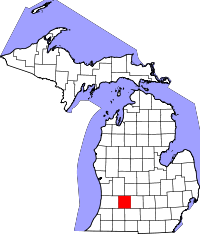 Barry County is one of eight counties in Michigan known as the "cabinet counties", so known for being named after eight members of President Andrew Jackson's cabinet in 1829. Barry County, specifically, was named after William Taylor Barry, the U.S. Postmaster General. The county is part of the Grand Rapids metropolitan area and has about 60,000 residents.